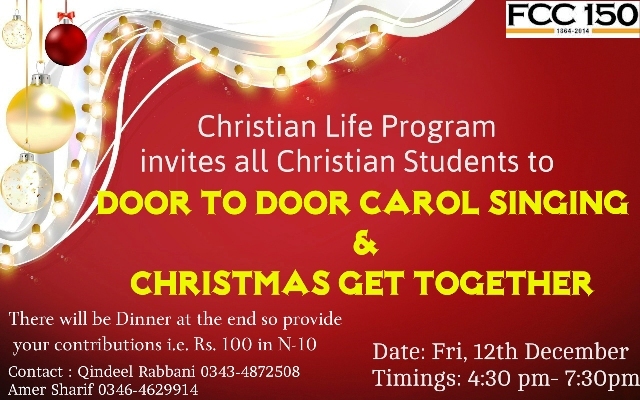 FCC’s Christian students are invited for carol singing with the Christian Life Program on Friday 12 December 2014. We will visit houses on campus while singing Christmas Carols. Please gather in front of the FCC Chapel at 4:30 and begin from there. Let’s spread the happiness by Caroling. Santa Claus will also be with us to present gifts and sweets. 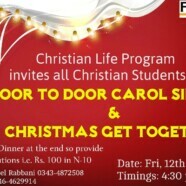 All the gathered students will also have a Christmas get together and dinner at the end. There is a surprise for all the attendees also. Interested students must contribute Rs 100. Give your contributions in N-Block Room # 10.